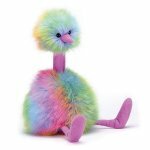 Zooming down from a fabulous planet, Rainbow Pompom is here to dazzle! This quirkster's just a bif ball of colorful sherbert fluff. Here to dance and discover new games, Rainbow Pompom can't wait to meet you!